This article was last updated Jan 15, 2019, but some terms and conditions may have changed or are no longer available. For the most accurate and up to date information please consult the terms and conditions found on the issuer website. If you’re in college and looking to get a jumpstart on building your credit, opening a student credit card can be a good place to start. There are several cards designed for credit newbies that provide the opportunity to build credit when coupled with responsible credit behavior. The newest addition to the student credit card market is the Citi Rewards+℠ Student Card. This card stands out among competing student rewards cards by rounding all purchases on the card up to the nearest 10 points in rewards. So, if you spend $1 on a candy bar, you earn 10 points, and if you spend $13 on lunch, you earn 20 points. Know that in order to be approved for your first card, you have to be at least 18 years old and be able to prove you have a steady source of income. We’ll review what sets the Citi Rewards+℠ Student Card apart from competitors, where it falls short, and compare it to another popular student card. Get 10% Points Back for the first 100,000 ThankYou® Points you redeem per year. So, if you redeem 15,000 points, you get 1,500 back—it’s that simple. $0 annual fee. 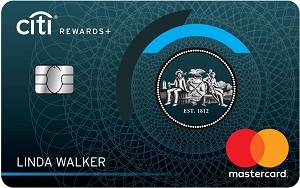 Similar to other student cards from major issuers, the Citi Rewards+℠ Student Card has a $0 annual fee. This is helpful for students who may not have the means to pay an annual fee, and welcome news since the Citi ThankYou® Preferred Card for College Students was removed from Citi’s catalog in 2018. All purchases round up to the nearest 10 points. The Citi Rewards+℠ Student Card is a great fit for all the small purchases you’re bound to make as a student. Whether it’s a $1 pack of gum, $2 bag of chips, $4 notebook or other purchase, all transactions will be rounded up to the nearest 10 ThankYou® Points. This clever feature encourages you to charge less expensive purchases on the card, and rewards you for doing so. However, as with any credit card, make sure you have the money to pay off the balance every month or you could charge your way into trouble. 10% points back from redemptions. When you redeem points, you’ll receive 10% back on up to 100,000 ThankYou Points per year. For example, if you redeem 25,000 ThankYou Points for gift cards, you’d receive $250 worth of gift cards, but 10% of those ThankYou Points would be credited back or 2,500 ThankYou Points. You can then redeem those ThankYou Points for an additional $25 in gift cards. Low everyday rewards rate. When you make purchases outside of gas stations and supermarkets, you only earn 1 ThankYou Point per dollar spent. However, this is pretty typical of student cards. If you want to earn a slightly higher rewards rate on everyday purchases, consider the Journey® Student Rewards from Capital One® with 1% cash back on all purchases; 0.25% cash back bonus on the cash back you earn each month you pay on time. It’s worth pointing out that the Citi Rewards+℠ Student Card’s roundup feature helps make up for the subpar everyday rewards rate. Select & Credit: Points can cover various eligible purchases via statement credit. Citi® Concierge: When you need assistance with travel, shopping, dining, entertainment or everyday needs, representatives are available. Citi® Private Pass®: If you’re trying to get access to popular concerts or sporting events, the Citi® Private Pass® benefit can help. You can receive exclusive presale ticket and VIP package access to the latest entertainment events at citiprivatepass.com. If you want a card that encourages good behavior and provides a path to a higher credit line, consider the Journey® Student Rewards from Capital One®. This card rewards students who pay on time via its rewards program: 1% cash back on all purchases; 0.25% cash back bonus on the cash back you earn each month you pay on time. The ability to increase your rewards by 0.25% is a great incentive to pay on-time. And, if you make your first five monthly payments on-time, you’ll not only benefit from the 0.25% cash back bonus, but a higher credit limit. Since many student cards have low credit limits, this is a helpful way to expand your purchasing power; but just make sure you don’t overspend. Students who plan on traveling outside the U.S. or studying abroad should look for a card with no foreign transaction fees. The Journey® Student Rewards from Capital One® has none, while the Citi Rewards+℠ Student Card charges a 3% fee. If you have large purchases to make, such as textbooks or a laptop, the Citi Rewards+℠ Student Card is the better choice, offering an intro 0% for 7 months on purchases (after, 16.74% - 26.74% (Variable) APR), while the Journey® Student Rewards from Capital One® doesn’t offer a 0% intro period. The Citi Rewards+℠ Student Card is a good choice for students looking to build credit while maximizing rewards on less expensive purchases. This card provides great rewards bonuses with its round up feature and 10% back on up to 100,000 ThankYou Points per year. Use this card responsibly, and upon graduation you could have a good credit score. Which Hilton Honors Credit Card is Best for You? AAdvantage Aviator Red World Elite vs. Citi AAdvantage Platinum Select World Elite credit card – Which is Better for AA Miles?